The Second World War is well underway and young men are signing up to help protect their country, including young Desmond Doss (Andrew Garfield). Doss is like no other, though, he is a strong, devoted Christian who will not carry a weapon nevermind take a life. Doss is cleared to go onto the battlefield without a weapon, providing service as a medic, as he looks to save people in this time of mass killing. Mel Gibson's fifth feature film as a director brings us a different kind of war film. 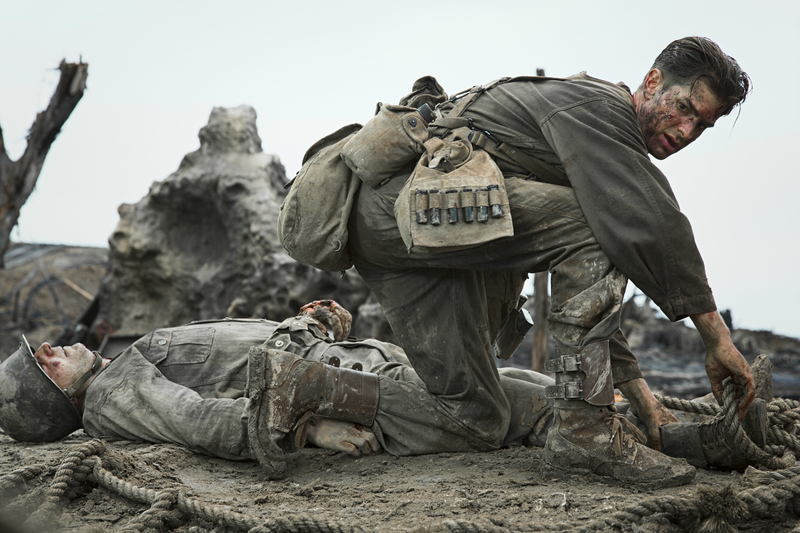 Instead of focussing completely on the killing sacrificial side, Gibson opts to bring the true story of one of the war's greatest heroes who didn't take a single life. 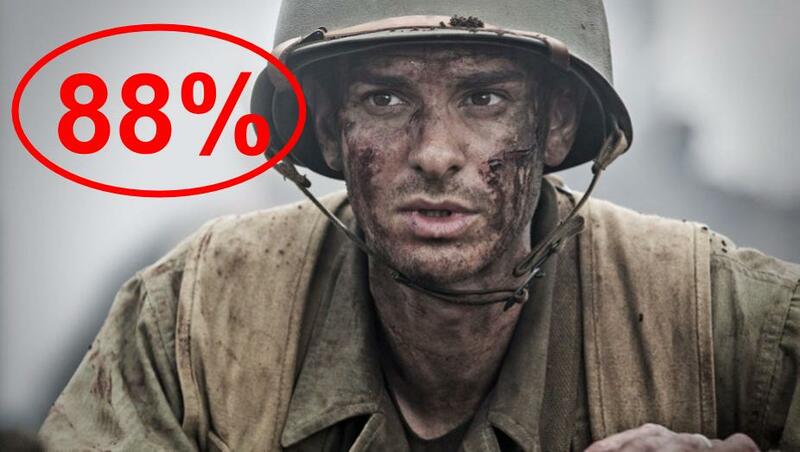 Desmond Doss was a devoted, seventh day Adventist who had no problem at all with serving his country during the war. A kind spirit who only wanted to help those in need rather than to cause harm. Doss is portrayed wonderfully by Andrew Garfield who shines despite seeming overly quirky at the start of the film. This seems to be the case for the full film as Doss seems incredibly cheesy at first, as does his reason and actions leading to his strong beliefs. There is no worry as there is a clear progression through the story, becoming more serious and emotional, adding more information to resolve any previous gripes. Garfield has cemented himself as a genuine, top quality actor this year with great work in this years 'Silence' and of course for his Oscar-nominated performance in 'Hacksaw' which is fully deserved. The character Doss is a very intriguing and interesting one. You feel sorry for him simply due to him leaving those who he loves to go to the war. Once he gets to training, he's berated and called a coward due to his beliefs, leading to him getting some very harsh treatment from his comrades. Doss' determination and spirit doesn't crack one bit as he continues to strive to do what he signed up for and eventually, to prove everyone wrong about him. The spirit of Doss brings heart to the film and to a genre which is generally associated mainly with brutality. The film captures Doss' beliefs perfectly, bringing some truly incredible scenes that are uplifting and incredibly humane. The scene where Doss spends the night alone on Hacksaw single-handedly saving soldiers - both American and Japanese - is perfectly handled. The actions, cinematography and score all combine perfectly to create something special and although no words are said, the message is loud and clear. It's scenes like this that make you wish Gibson had made more movies by now as he has a clear talent for creating inspirational, impactful and emotional large scale movies. As it is still a war movie, the casualties are still very high and Gibson is relentless with making the war seem as brutal as it was. From rat feasting on corpses to maggots infesting skulls, slit throats to headshots and stabbings to suicides, the cost of war isn't covered up or romanticised at all. The first action scenes show the brutality of the war perfectly and how it isn't giving any mercy to anyone as many men are gunned down instantly in brutal fashion. The action is second to none with large battlefields showing the amount of destruction caused in only a couple of minutes. Gibson's direction in these scenes is incredible as he draws out plenty of emotion whilst showcasing the sacrifice but in a truly terrifying way. Hugo Weaving finds himself very unlucky to find himself without an Academy Award nomination. As Doss' father and army veteran come drunk, Weaving is incredible in every scene he is in. Whether he is at the graves of his fallen friends, scowling his sons or being pivotal to Desmond's duty, Weaving steals the show. It is a travesty that he hasn't gained his first Oscar nomination for his role in 'Hacksaw Ridge'. Teresa Palmer was criminally underused in this film as Doss' wife Dorothy. The first act follows the building romance between the two before Doss signs up and then for a short time during his court trial. We never return to her again as the film misses a huge chance to create a powerful and emotional moment by reuniting the two. Vince Vaughn also shines as the Seargent troubled with training the new recruits. His first scene in the film is gold and allows Vaughn to showcase his abilities as a comic actor but in a very serious manner. This is Vaughn's best performance to date and was highly enjoyable to watch throughout his moments in the film. 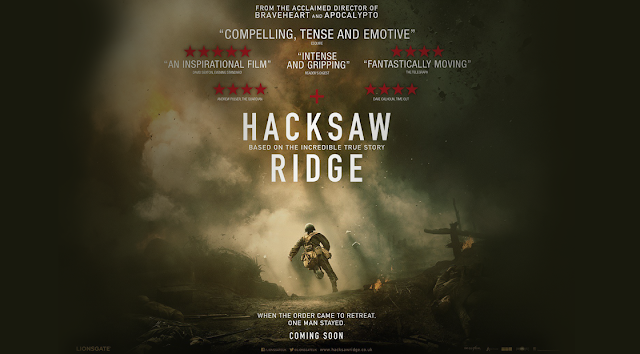 'Hacksaw Ridge' is most definitely one of the best films of the year, drawing great performances and emotion from those involved. This is a special kind of story in a brutal genre that should be appreciated by all. So have you seen 'Hacksaw Ridge'? If so, what did you think of the film? I hope that this review was useful for if you were planning on seeing the film or not which I recommend you do so. Once again, thank you for taking the time to read my review, it is much appreciated!